"My horse was lame due to collateral and oblique sesamoid ligament problems. I used the Sonivet initially for 4 weeks and then another 4 as it improved. My horse was happy to stand for 20 minutes while I did the therapy, as there is no noise and she was relaxed. The lameness improved to the stage where I started to ride her again." 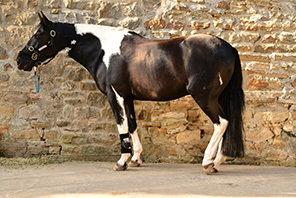 "I have used SONIVET on a previous SDFT tear case where the tendon had received a significant injury resulting in a large degree of structural disruption, the horse responded well and returned to work in 3 months rather than the predicted 6." "I have been impressed with the effects of Sonivet on my 2 year old after the removal of a bone cyst. The results were noticeable after 1 week and the method to apply the sonivet is so simple to use. The service provided by Curar is second to none. High recommended." Sonivet is a type of LIPUS therapy that accelerates the healing of recent fractures, delayed fractures ligaments and tendons. It promotes a faster return to activity and can help reduce re-injury.